OK, honestly, I'm really excited for this. I think I'm gonna try to get my hands on it once I get an iPad. Because, seriously. Producing male idols. Does that mean you get to produce Hokuto? Because I want to produce Hokuto. It'd make no sense NOT to have him in this game! Him and Jupiter are the only male idols worth anything in this series. Well, they're the only male idols, period. And I really want to see post-good ending Ryo so bad. I want to see a happy, confident Ryo. I am very curious about the new idols, though! I hope this idea goes beyond just a card game eventually. I love seeing those rare otome games with fun gameplay. YES!! Please we get an official announcement soon. I wanted more male idols since Ryou! Hopefully they don't overload us like CG. 20 more guys seems good enough, plus Jupiter and Ryou. Think of the inevitable shippings and CDs... Yes, it will be glorious. Now here's the big question: Will Ryo be in this? I hope so. It'll prove that Namco somewhat still cares about 876 and hasn't reduced them to DLC idols. So... apparently this is a thing now. Neat. Almost certainly won't play it, though. Even if we got comics and stuff like CG, it would probably be just like CG and we wouldn't ever see Jupiter. And I swear if there are "over 100 idols to produce", I'm going to pass out from sheer number of wiki pages. In any case, I'm interested in seeing where this goes. Hopefully, Namco doesn't give too much effort on this and let it grow on its own. Let it take the sleeper hit route that Cinderella Girls did. Well, this is now a thing. So i take it that its a brand new production company called 351Pro with Jupiter stopping by to say "Yo". I can live with that. Its world building without over-saturating 765Pro's idol count. (50 is enough!) However, it does bug me that its a card game AGAIN. I'm also not digging the character designs too much. Maybe I have to give it time, but none of these boys (besides Jupiter) really stuck out to me. Though judging by the group shot at the end of the trailer, we COULD be getting some trap idols ala Ryo, which are always welcome in my book. Speaking of Ryo, not a single sign of him! Namco Bandai, PLEASE do something about this! It looks like there's more of a focus on their lives before coming idols, like the famitsu article talked about "from a pilot/pro soccer player/part timer/etc. to an idol!" The designs are a little bland, but they're rather cute. Translated a few of the descriptions, by the way. Looks like these three are the Yukiho/Chihaya/Yayoi or Miki/Haruka/Chihaya that you start with... Or so I thought, but Tsubasa is an Normal-type while the two others are Rare. Teru Tendo: The red-haired one. From an attorney to an idol! 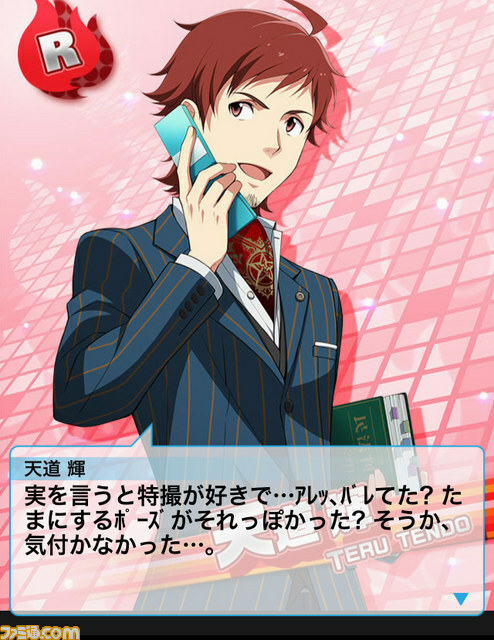 "My name's Teru Tendo, and I'll become the idol world's brightest star!" 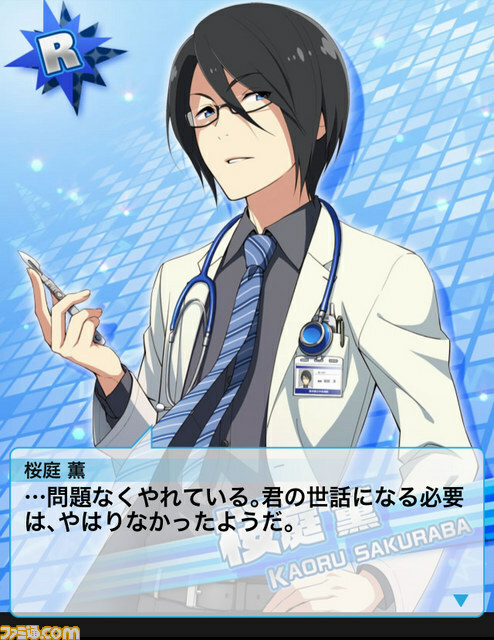 Kaoru Sakuraba: The one with black hair and glasses. From a surgeon to an idol! "There's no value in putting us in a team." 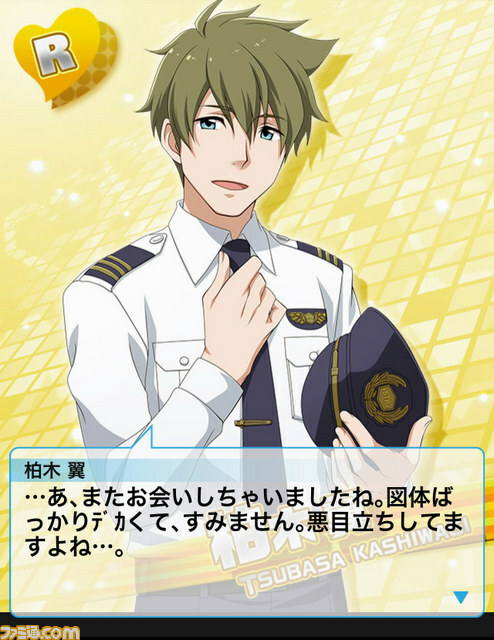 Tsubasa Kashiwagi: The one with brown hair and blue eyes. From a pilot to an idol! "I... Want to stand there as well." The cards look exactly like ML lol. At least it's on mobage so I can give it a try without too much hassle. 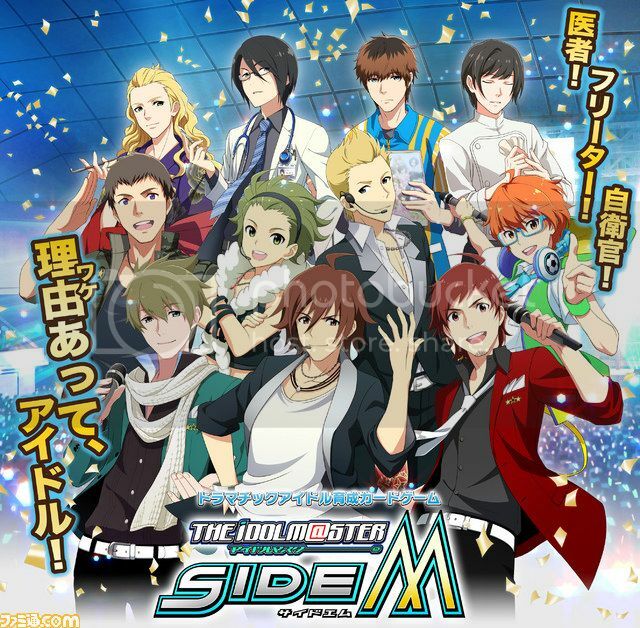 961PRO website = "Touma Amagase"
SideM PV = "Toma Amagase"
Why did they drop the "u"? "I am actually a fan of tokusatsu... Wait, you already knew? Sometimes I make poses like that? I see, I never noticed..."
"...Ah, we meet again. Sorry about my large build. I stand out pretty suspiciously because of it..."
"...I'm getting along just fine. Guess I really didn't need your help after all." Looks like half of the regular Cinderella girls.. I'm guessing this is because that is how it is pronounced. The "u" in Touma extends the sound of the "o" in "To". Sometimes people use Toma (usually with a bar over the 'o') to be a romaji version of とうま (touma). No Ryo to be found! Also, one looks like Takane with short hair, one looks like Brief from PSG, and another looks like Chris Weatherfield from TMGS2.